1. Is there a minimum number of meetings? A Community Service project such as helping in a community food kitchen, participating in a park or other environmental clean-up, or arranging a food/clothing drive. A Global Friendship project such as sending out a batch of Peace Packs, engaging in a Pen Pal project, or reaching out to another other culture in a meaningful way. A Thoughtful Acts of Kindness project such as The Great Kindness Challenge, Peace Day Challenge or Peace of My Heart project. It’s also a good idea to build in an introductory/refresher and planning meeting at the beginning of each year. Each project could be a single “event” or may include a number of meetings comprising planning and implementation. 2. Is there are minimum or maximum number of members? No. We have chapters with 3-4 members … and chapters with thousands of members! Generally, Neighborhood Chapters are smaller than School chapters, often starting with one or two families. This is wonderful because it reflects the grass-roots way that Kids for Peace itself started! School chapters vary greatly in size, depending on the population of the school and the format of the School chapter as classroom-based, grade level, lunch club or school wide. 3. Do I need a co-leader? Each chapter needs one adult leader. Many chapters also have one or more co-leaders, but this is not mandatory. It can definitely help to have an extra set of helping hands and working with a co-leader can add extra fun, but it’s up to you and your chapter to decide what works best. Co-leaders can sign up when the chapter is first registered or can apply at any time after the chapter is launched. For U.S. based Neighborhood chapters and some U.S. Affiliate and U.S. School chapters, there is an online background check to become a Chapter Leader. The process for one leader is included in the application fee. Co-leaders are asked to pay $15 to cover additional background checks. 4. Can our chapter have a youth leader? Each chapter is required to have one adult leader. We encourage and welcome interested youth (under 18) to assist as youth co-leaders. A youth interested in being a co-leader must be a registered member of their chapter. The youth leader will be recognized as a co-leader of the Chapter on our Chapter Directory. 5. Are there registration fees? What are they used for? U.S. Chapters are asked to pay a one-time registration fee of $50 or $250, depending on the type and size of the chapter. There are no registration fees for International chapters. The Chapter Registration fee goes towards the set-up process (including an online background check for up to one adult Chapter Leader), hardcopy of the Chapter Leaders’ Manual, copy of “Wish Big” Kids for Peace book, some other small welcome goodies, and access to ongoing support and online materials. 6. Are there membership fees? What do they go towards? Members of U.S. Neighborhood chapters are asked to pay annual membership dues of $20 per youth member. This can be waived in cases of financial burden. The membership dues go to Kids for Peace Global to maintain the chapter support function and tools, and to assist in the maintenance and development of Kids for Peace programs. Chapters are welcome to charge a separate “chapter membership fee” which is retained by the Chapter and can be used for project materials, venue rental (if needed), snacks etc. However, we want to “create PEACE for one and all” so children are not to be excluded based on inability to pay. 7. How are KfP Chapters funded? 8. What ages of children are involved? Can I focus on a particular age range? Membership is open to children of all ages! The majority of our members are aged 4 to 11. 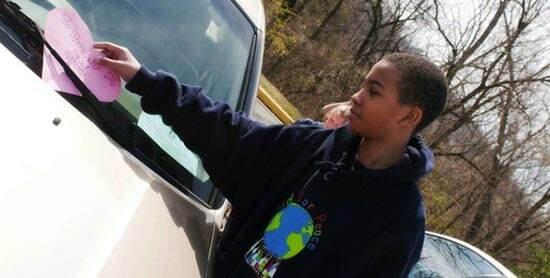 We offer project and curriculum adaptations for young teenagers/middle-schoolers (aged 12-14) and older teenagers/high-schoolers (ages 15-17). Older children are also encouraged to take on leadership roles within the chapter. Many of our chapters mix children of different ages. Other chapters, particularly classroom or grade-based school chapters, focus on a particular age range. As part of the Peace of My Heart project, kids all over the world distribute hearts with messages of love and hope. 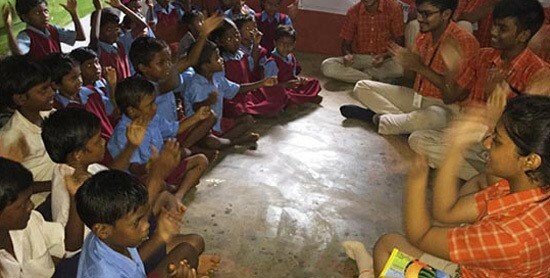 The SAI International School Kids for Peace chapter in Bhubaneswar, India hosts a book drive, installs a library, and shares story time with underserved neighborhood friends. 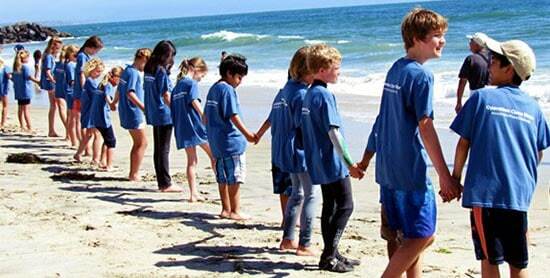 The Kids for Peace founding chapter in California, USA creates a public service announcement (PSA) to encourage others to protect and save the ocean. Kids learn about children in other cultures and then create Peace Packs (knapsacks filled with school supplies, toiletries, toys, and a note of friendship) to give to their new friends. 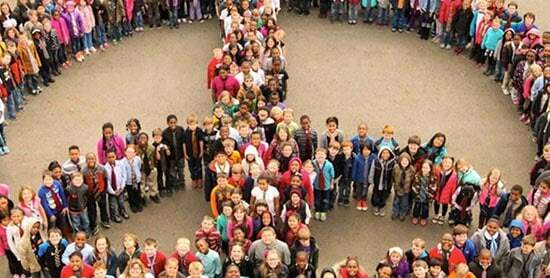 Kids in the United States show their unity at school with a giant peace sign. 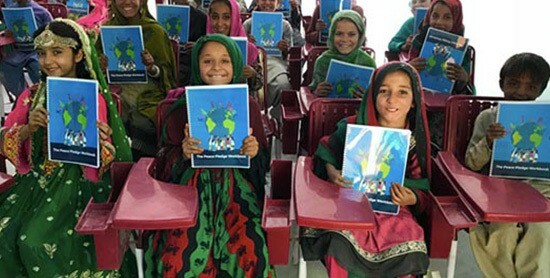 Kids use their Peace Pledge Workbooks to learn how they can put peace into action at the Kids for Peace School and Peace Center of Pakistan. 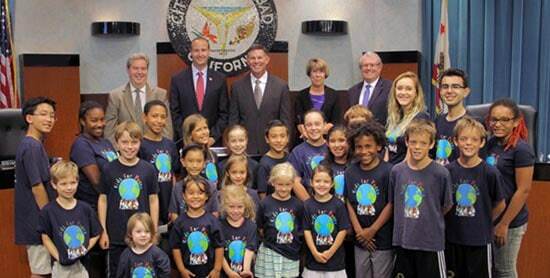 The Kids for Peace founding chapter in California, USA uses kind words to express gratitude at a city council meeting. 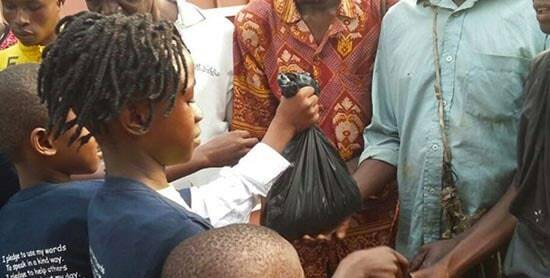 The Kids for Peace Sierra Leone chapter in Freetown, Sierra Leone grows vegetables in a community garden and shares the harvest with those in need. 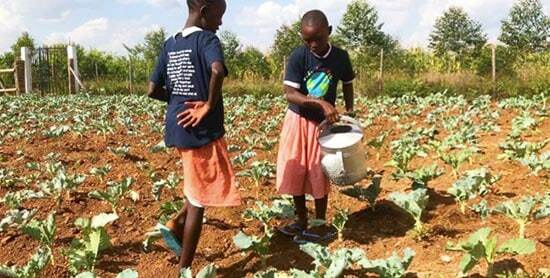 Kids tend their school garden at the Kids for Peace School of Kenya. 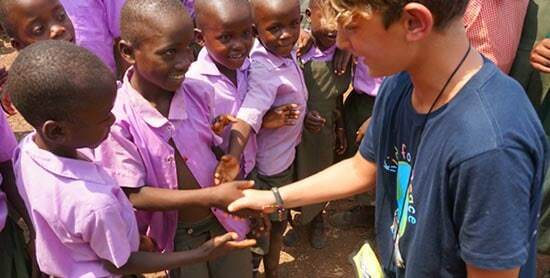 Kids travel to other countries,learn about each other, and make new friends. 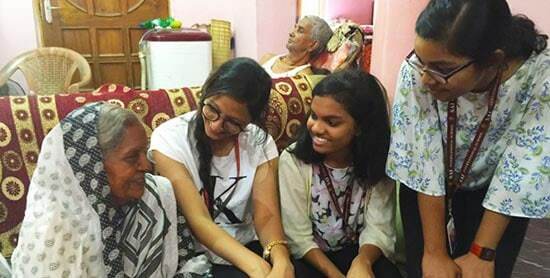 The SAI International School Kids for Peace chapter in Bhubaneswar, India brightens the spirits of local elders with cards, flowers, songs, and happy conversations. 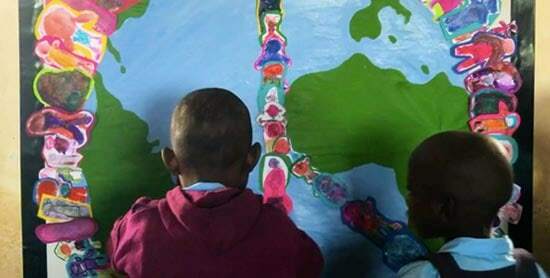 Kids express their commitment to creating peace through art at the Kids for Peace School of Kenya. 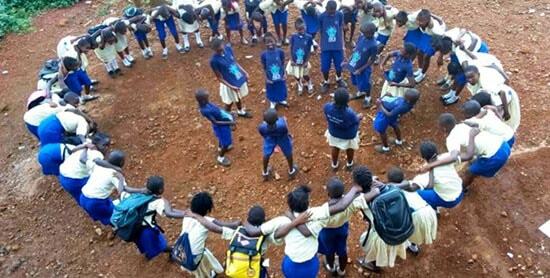 The Kids for Peace Salone chapter in Sierra Leone uses kind words through song to uplift friends. 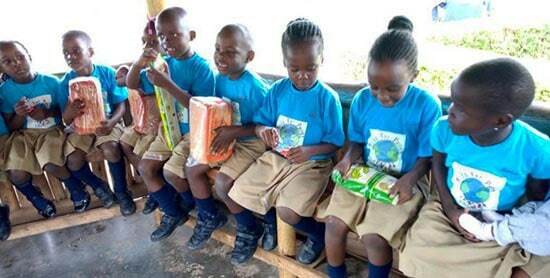 The Gombe Education Brand Kids for Peace chapter in Kampala, Uganda collects and delivers useful supplies for babies in need. 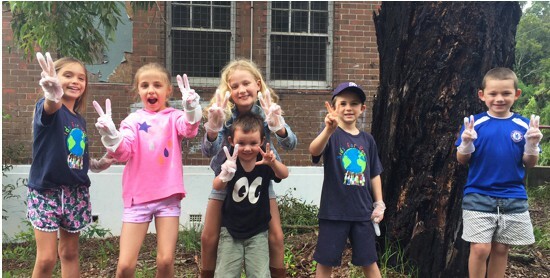 The Killara Kids for Peace chapter in Sydney, Australia cleans up local unoccupied land. 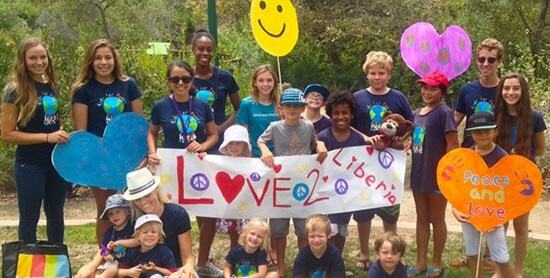 Kids express love and care through chapter to chapter messages. 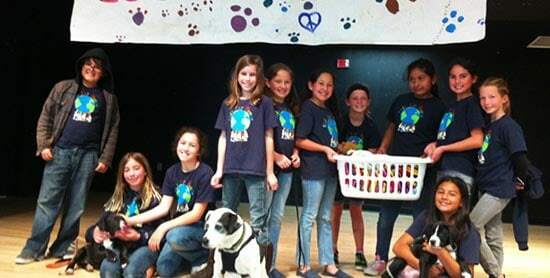 The Kids for Peace founding chapter in California, USA joins together to take care of animals. 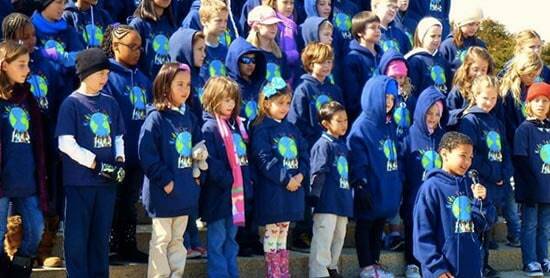 One by one, kids from chapters all over the United States inspire others during their rallies for peace.